Political direct mail has never been more important. As voters lose trust in politics, a survey shows mailers are the most credible form of outreach. Connecting with voters and establishing a relationship of trust has never been more difficult for political candidates and incumbents — yet, it’s never been more important. In today’s split political environment, the question becomes: How do I reach potential voters in a compelling, trustworthy way? As Nov. 6 gets closer, candidates are in the final stretch of their midterm campaigns — connecting with voters, spreading their message, and sending out last-minute political direct mail. It’s their final chance to make an impact, and every single effort counts. So what makes political direct mail the candidate’s linchpin? No matter how much marketing diversifies with the internet and social media, political direct mail performs, statistically speaking. Direct mail achieves a 5.1% response rate, compared to .6% for email, .6% for paid search, .2% for online display, and .4% for social media, according to the Direct Marketing Association’s (DMA) 2018 Statistical Fact Book. Additionally, the DMA discovered direct mail’s overall response rates are 10 to 30 times higher than that of digital. In a world of ever-changing marketing opportunities, direct mail receives higher response rates than digital efforts. That’s great, you may be thinking. But what about ROI? People may be looking at their mail more carefully than their email, but does that actually translate to more business, more votes and more results? For every $167 spent on direct mail in the US, marketers sell $2,095 in goods, according to Print Is Big. Interested in today’s changing political climate, the United States Post Office commissioned a voter survey intended to explore voter attitudes about the different forms of political outreach in 2017. The survey’s results may have surprised some — but not us. It found 68% of people put political direct mail in their top-three most credible forms of political outreach. In fact, political direct mail outpaced TV (59%), in-home visits (47%) and digital ads (26%). Bottomline: Voters find political direct mail to be the most credible form of outreach. High response rates and ROI, along with increased credibility, are not the only benefits of a political direct mail campaign. Overwhelmed by cluttered email inboxes, consumers find the organized stack of mail to be a more organized, stress-free source of receiving information. In fact, it can be a relief after a day of fielding non-stop emails, calls and text messages. The thing about mail is it forces you to sit down, stop everything you’re doing, and focus on what’s in your hand. It’s tangible. It’s something you can walk away with. It’s something you can hold onto and share with others. That familiar feeling of picking up a piece of mail is at the heart of political direct mail’s most attractive quality: It makes a lasting impression. In fact, 60% of people surveyed by the UK Royal Mail service said the tangible, emotional effect of holding a piece of mail makes a lasting mental impression, making the mailer easier to recall later. Additionally, 57% of respondents said that postcard marketing makes them feel more valued and creates a more authentic relationship. Whether you’re trying to catch those valuable swing votes or solidifying votes in the final days, studies agree: Political direct mail remains an effective, proven method of reaching your target audience, according to DMA. Over the past 30 years, we’ve successfully handled hundreds of political mailings, and along the way, we’ve learned a few strategies that help your political direct mail stand out to voters. When done the right way, political direct mail empowers you to reach your ideal target audience. An experienced mailing professional can help you develop a list that reaches voters based on parameters ranging from party affiliation and voting frequency, to gender and geographic location. Your campaign can avoid overspending by targeting only those voters you need to reach. It’s an understatement to say there is a lot of political direct mail showing up in mailboxes right now. So how do you stand out in a crowd? It’s key to have a clear message with a strong call to action, partnered with a winning design. It’s also worth testing different sizes that really stand out, such as oversized 6×11” or 8.5×11” mail pieces. Absentee voters contribute a large portion of ballots, and when it comes to campaigning, you’ll want to pursue those votes before making a “get out the vote” push in the final run-up to Election Day. Here in California, the absentee ballot must be postmarked by Election Day and received within 3 days of Election Day, and yet, many voters submit their ballots even earlier. That means you’re in the prime period right now to get your message out to those voters. 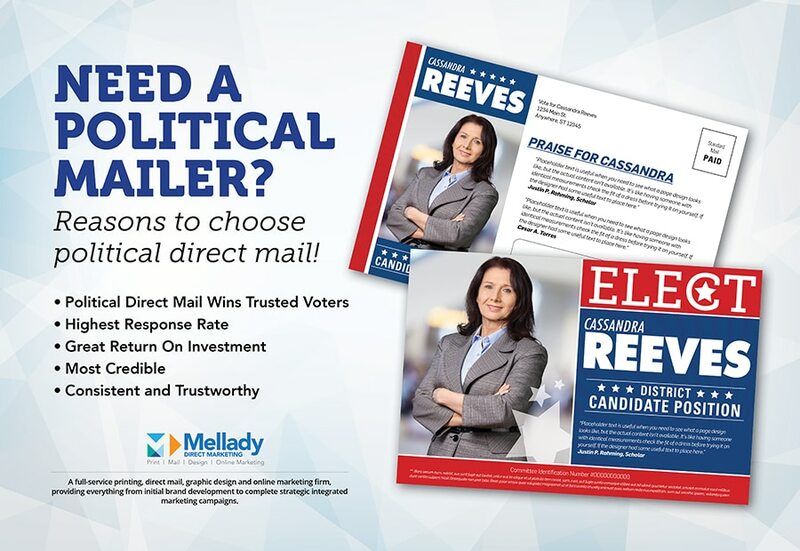 When you work with an experienced mailing firm, such as Mellady Direct, the process of reaching those voters with a well-designed, highly targeted piece is streamlined. We’ve seen, time and again, how direct mail works for political candidates. It continues to see strong response rates across generations, as well, even among younger people raised on technology. The response rate to direct mail among 18-21-year-olds – a key voter demographic – jumped from 4.1 percent in 2012 to 12.4 percent in 2013, according to a study by the Direct Marketing Association. Despite a technological revolution, studies continue to find people still respond to print marketing. If you’re a candidate who needs to get out the vote this election season, political direct mail can help provide the extra push you need. Are you ready to give your vote to political direct mail? Mellady Direct Marketing is ready to help you stand out. Click here to contact us today and get started. There aren’t many businesses today that can claim they have given their clients over 32 years of professional service. Mellady Direct Marketing can. Our direct marketing company has grown to a nationwide digital and print marketing company, meeting the direct mail marketing needs of the Santa Clarita Valley and beyond. A lot has changed in the past 32 years, but one thing we know for sure: We love what we do, and we continue to think about the future of our company, make our processes more efficient, and save our customers money. At Mellady Direct Marketing, your business is our business.